All languages undergo transformation over time. But it must be only the Queen’s language which has gone through such a huge upheaval of sorts. Makeover of languages happens with changes in grammatical usage, sometimes spellings, addition of new words,.. (Like we keep hearing of new words which enter the lexicon every year – “Selfie” being one such overused word these days!!!) However it must be only English which apart from going through all this also has been metamorphosed due to technology! Technology can be disruptive. At times the disruptions are by default but most of the times they are by design. I can’t fathom if the disruptions in English language due to technology have been deliberate or they just happened. And I don’t think any other language has been so vulnerable to technology as English. With the advent of computer first and then mobile devices, the face and shape of English have gone through a transformation. Today when you receive a communication either through e mail or through short text, it is possible to guess the age group or the generation to which the sender belongs!!! It can be as polarizing! The initial days of the mobile phone were quite normal. Then debuted the new tool of communication called SMS (Short messaging service) after which English language has never been the same again. 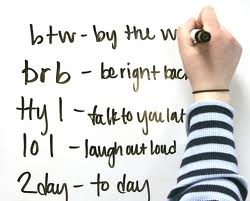 What initially started as a means of super-fast communication using abbreviations and acronyms soon became the norm of the language. And it became so uncool if you are part of the old school typing full words and sentences and doing the mandatory spell check before hitting the “Send” button. I remember pieces appearing in newspapers/magazines,.. that time explaining to the uninitiated the so called “SMS lingo”. In Mid-Day newspaper there was a daily box called “SMS lingo for the day”!!! I mentioned in my opening remarks that English as a language is so vulnerable to technology that the contrived form which came popular while sending the so called short messages soon started pervading into the normal communication as well. So today you will find the acronyms, short forms and abbreviated type of communication being used in normal long e mails, notes, wherever. Even business communication has not been left behind. Is there a day where you spend at work without using “ASAP”, “FYI”, “NBD”,.. ??? One disclaimer like this “Sent from my mobile; please excuse the brevity, spelling and punctuation” is enough to sort of take care of any problems the other side might have! I now wonder what would have happened to the now almost extinct stenography if SMS lingo had made an advent much earlier!!! I also wonder if the “Spell check” tool will soon become superfluous. Because the “Spell Checker” will ink the whole page red. Even now as I write this its almost getting there. While one has been reconciling to this new reality and had almost concluded that things can’t get worse than this, came the next attack – “The Advent of smileys” 🙂 🙂 🙂 Again what started as a harmless way of expressing joy using 🙂 or sorrow 😦 soon developed into a full language of “Emoticons”. So much so today it is difficult to find any reasonable length of communication without an emoticon. Here again the rupture of the language come through technology. With people spending more time with their smart phones than anything else these days, it has become easier to just input a suitable emoticon from a whole bunch of smileys available today than typing even few abbreviated words. Ergo I was not surprised when I read this article (read here) some time back which said SMS lingo has now begun creeping into the answer sheets, assignments and even record books! And that, teachers were alarmed to see this. It may be a good idea for the teachers today to keep themselves abreast with the new Lingua Franca! And internet does help. Like Google Translate which helps to translate languages, there is this http://transl8it.com/ . Just type in SMS, text message, emoticon, smiley, slang, chat room/net lingo or abbreviations and “transL8it” will convert it to plain English to understand!!! With the assault of SMS lingo and smileys on the English language, I can imagine what the future holds for the Queen’s English. The day is not far off when my whole blog post will be with SMS lingo and smileys galore. Nd dis xchnge ment 2 b a jok may jus bcom real’ty!!! Boy: aaj kaisa din guzra…?? Boy: To kuch likh bhi, apne Baap ki shaklein kyu send kar rahi hai…. Boy: I heard u failed in English? Boy:😁🔫 meri maa tu smiley hi use kar..